"Monsters vs Aliens" has a very weird plot and it never really caught our attention. It seems that from our first impressions, "Monsters vs Aliens" will fail and we mean fail big time. But, maybe, just maybe, Dreamworks can pull a hat trick and make a wonder out of a zany plot that sounds a cliche' kids story to say the least. Can "Monsters vs Aliens" prove us wrong and be a rare gem in a filled up genre? Click "Read More" to find out. 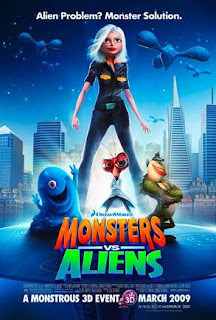 "Monsters vs Aliens" is literally a battle between Earth's monsters versus an evil alien named Gallaxhar. The story starts off with Susan Murphy's(Reese Witherspoon) wedding. Unfortunately for her, a meteor hits her but instead of killing her, it transforms her into a woman-giant. Susan is then taken by a secret military division that caters to keeping the world's monsters at bay. She is taken prisoner and their she meets four monsters namely, Dr. Cockroach Ph.D.(Hugh Laurie), the Missing Link, B.O.B. (Seth Rogen) and Insectosaurus. They cannot make any contact to the outside world until one day, an alien robot attacks the Earth. They are then selected to defend the planet from the alien evil doers. Can the monsters defend our planet successfully? Can Susan become a normal human being again? So what now for "Monsters vs Aliens"? Well it utterly surprised us in a good way. Seth Rogen just proves to be funny as hell once again while the other casts of characters are all interesting in their own way. But again, sorry Reese, Seth Rogen takes the cake for this film his character not only is a fit for his type of comedy but his lines are well-placed, well-paced and written well. The movie will make you jump out of your seats with laughter. The 3D graphics were well-made and keeps up with most of the 3D films being released in recent years. The negative thing we have with this film is the simple storyline and the predictable ending. We know that films like these are for kids but after seeing "Finding Nemo" or "Wall-E", we know it could have a more grander plot. "Monsters vs Aliens" is a must-see for brainless fun. Both kids and adults would like this film and we guarantee it. - the plot is predictable - what do you expect from a kiddie-themed film?